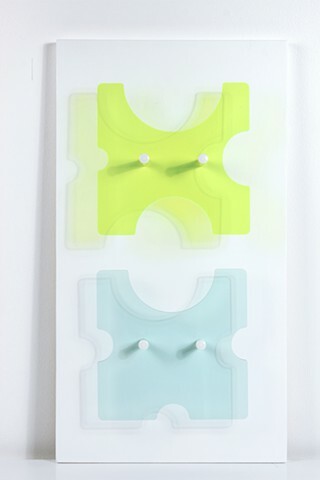 Fluorescent green and clear with green edge laser-cut acrylic sheet, nylon spacers, and capped hardware. Small samples of a system that uses value of digits from a number sequence to determine diameter of circles which than systematically take bites out of squares. Individual squares can be any size between 7" x 7" and 17" x 17", displayed individually or in small or large group as grid.